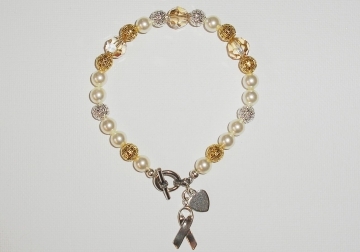 Show your support and raise awareness for any cause or disease with elegant gold and silver that goes with anything. This design is perfect for cancer, heart disease or AIDS awareness, or to remember loved ones away from home. 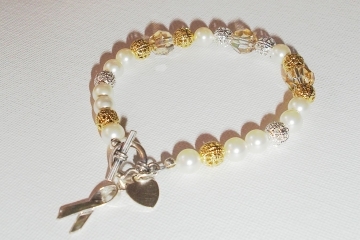 Make this gorgeous gold and silver awareness bracelet and wear it yourself or give it as a loving gift to someone close. 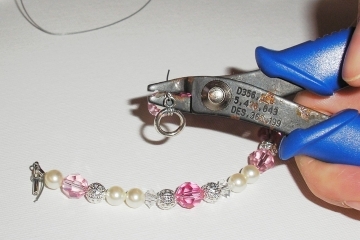 You've seen these bracelets selling for upwards of $100, so why not make one yourself and save, or sell them at your next jewelry party? Features genuine sparkling Swarovski crystal beads and pearls, silver and gold plated filigree beads, and a quality sterling silver clasp, ribbon, and heart charm. Swarovski crystal pearls, or freshwater pearls (quantity as desired for proper length of bracelet), I used 12 beads in my design. 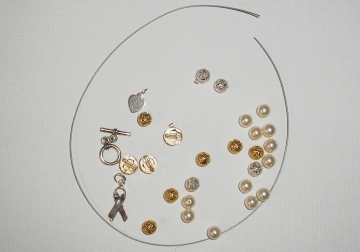 Decorative sterling silver or silver and gold plated beads for accents. I used 10 beads in my design.